Good News! Goods Unite Us has launched several HUGE new features on our IPhone app! And that’s just one of our groundbreaking new features. 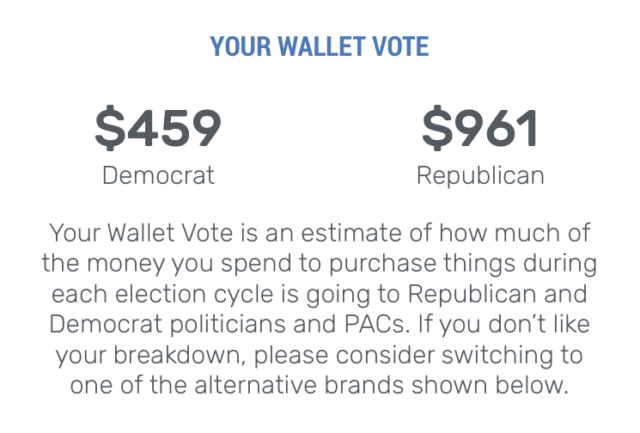 How does your wallet vote? Now it’s easy to find out. Our team at Goods Unite Us hopes that users will use their “Wallet Vote” numbers to change their purchasing behavior going forward. That’s why our new app also gives users a list of alternative brands that better align with their own political beliefs. These new app features will only help bolster our app’s rapid user adoption. We’ve been adding over 20,000 new app users every month, who are collectively viewing over 600,000 brand and company pages per month. And y’all are loving and using our data – we’ve received hundreds of emails from our users in the last few weeks alone telling us how they’re using it to change their purchasing behavior. Our goal is to reach 1M users on the app before the 2020 presidential election, bringing to fruition our mission of providing consumers with transparency around corporate money in politics. At the current rate of user adoption, it seems likely we will reach that goal!